Yeah, my boys are great eaters, but like most kids, they enjoy their burgers, pizza, and breaded comfort foods. Getting them to think outside that box can sometimes be a challenge. But I’m always working to make sure we’re branching out and continuing to expand their palates, or at least not giving up hard-gained ground. I certainly don’t mind making burgers or pizza once a month; but there has to be more to feeding a family beyond just constantly making the safe, favored dishes. Meatless meals around here continue to be a bit of a challenge, because my boys are carnivores, through and through. We’ve got a curated collection of acceptable vegetarian options, but again, J. and I are interested in branching out (and I think it’s healthy, and important, for the boys to do so). It occurred to me at some point that if I could come up with a wholesome homemade veggie burger, I might be able to sneak a new meatless meal into our rotation AND give at least a nod to an old standby. I’ll be honest: It’s rough going, you guys. The first time I made these, the kids were okay with them; but in subsequent dinners, they’ve been more and more annoyed about my replacement of their beloved burger with a veggie option. (It’s possible, since I’ve tested this recipe a bunch, that it’s just veggie burger fatigue that accounts for their downward spiral.) On the other hand, Loyal Husband J. — never a big veggie burger fan — has started actually requesting these. He’s loving experimenting with different toppings and enjoys having a hearty meatless meal that he can customize. So on the strength of J.’s recommendation — and my own — I’ve decided it’s time to share the recipe. These are NOT “meat replacement” veggie burgers. They don’t taste like beef. They don’t look like beef. They’re veggie burgers, and for me, a good veggie burger shouldn’t taste like it’s trying to fool me. It shouldn’t pretend to be something it’s not. It SHOULD, however, be moist, have a well-rounded flavor of its own, and taste good on a bun with various toppings. 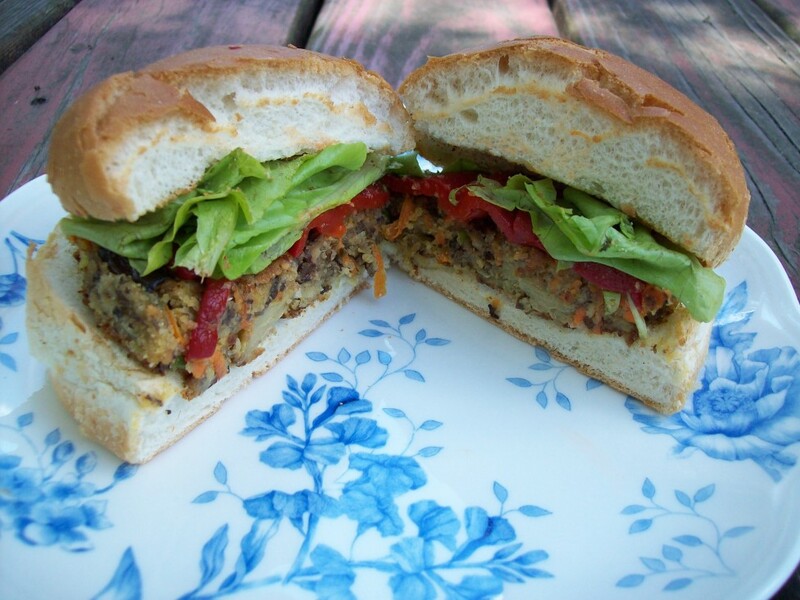 This veggie burger recipe hits all the requirements for me, but you can also feel free to change things up and experiment with different seasonings. I tried to keep things fairly simple, but you may prefer your burgers spicier, or with different herbs. Consider this a blank canvas that you can make your own.